Edralis is a creature of many interests - including historical clothing (primarily late middle ages), linguistics and paleontology. This blog was created to record her adventures in sewing and for the occassional musings on related topics. Her favourite Ancient Greek pottery shapes are pyxis and alabastron. 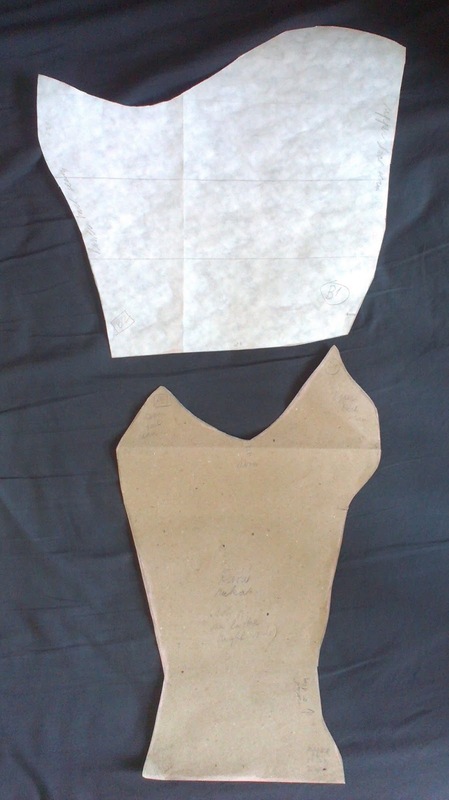 So far I went through three sleeve mock-ups and I am nowhere near content with the cut and fitting. In the end I decided for practical sleeves, quite loose at the shoulders (and probably also with a diamond-shaped gusset applied to the armpit, so I won't be in constant fear of ripping the seams open when reaching for something), but with tightly fitted forearms. 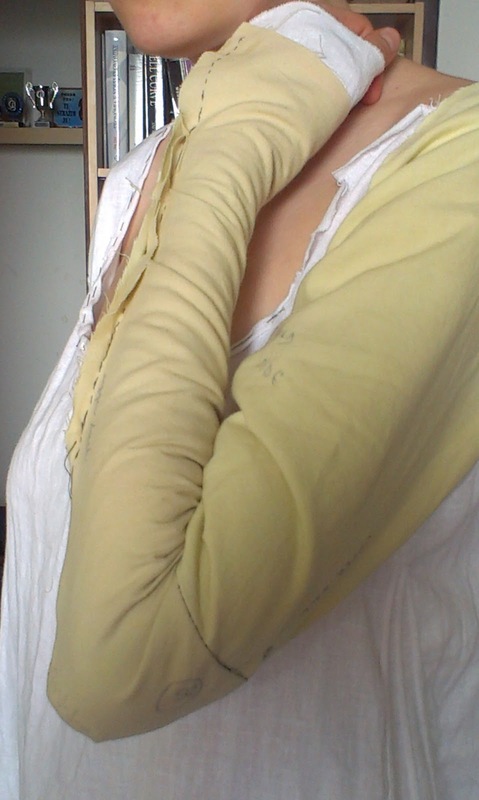 I've wanted to be able to move my arms freely, but also to make the sleeves snug at the lower arm. 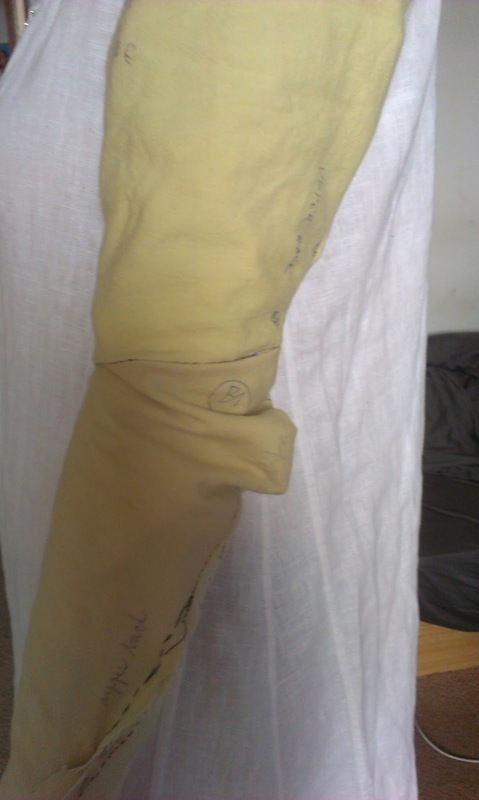 And I decided to try to construct the sleeves of my kirtle using the elbow hinge. 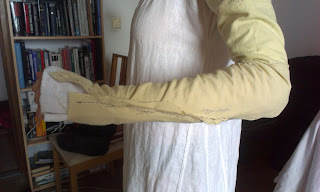 The white pattern is the upper part of the sleeve, ending above the elbow. 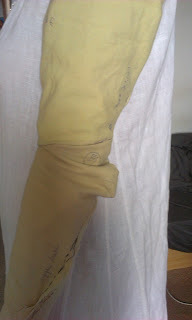 The brown pattern is the lower, forearm part of the sleeve. The "wings" form the hinge, creating additional space for the elbow when the arm is flexed. So far so good. 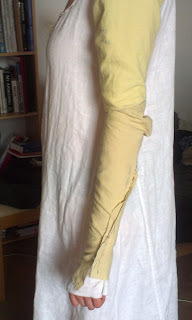 It is comfortable at the elbow; maybe just a bit too tight at the forearm - but that can be easily remedied. I can't say I'm surprised. 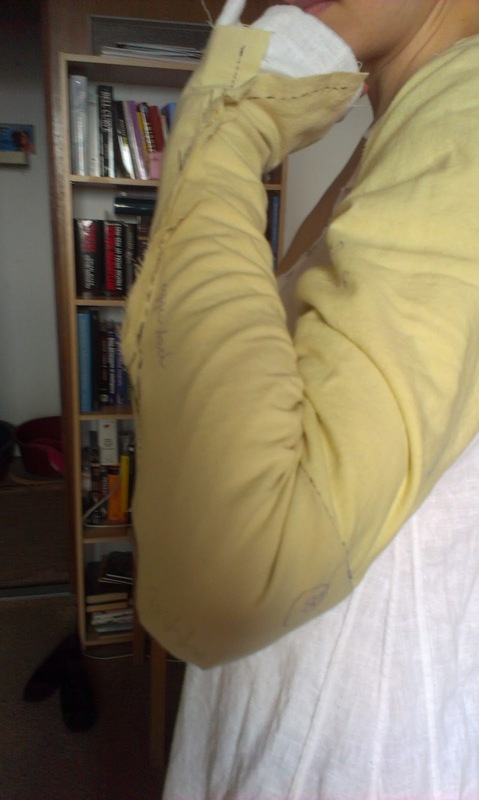 Of course there would be some bulging - presumably proportional to the tightness of the sleeve and the roominess of its elbow part. But this just looks... a bit too much, perhaps? Maybe it will look slightly different when done in dark wool on linen, maybe it's simply a price for having the cake and eating it too (super fashionable tightness AND mobility). 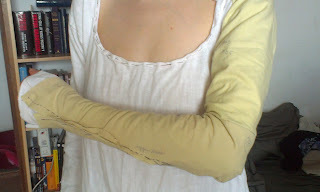 Or maybe I could try widening the upper sleeve, so it would be looser and the bulging wouldn't show this much? Or I can reduce the wings of the hinge, and simply accept that the extreme bending at the elbow simply won't be very comfortable. I am - i.a. a(n): INTJ, pacifist, liberal, utopian communist, existentialist, liberal, atheist/agnostic, vegetarian, anti-abortion but pro-choice, Ravenclaw, and a person in progress. I spin wool while reading mature fanfiction and read wikipedia articles while walking on treadmill. A Mongolian link for hennin?